This 10 x 14 Cley Summerhouse was designed by our customer, who wanted a dedicated Summerhouse to act as a play room for their kids in order to encourage them to play outside more often. The exterior of this building is constructed using our Shiplap cladding, coated in 'Pebble' from our Valtti Paint System - the roof is finished with Cedar Shingles. The windows and doors are coated in Ivory which provides exceptional protection against the elements ensuring longevity of the building. The building consists of double doors and the eight windows allow plenty of natural daylight into the building and additional ventilation through the ones that open, of which their are four. All of our buildings are hand-built at our factory in Narford, Norfolk. 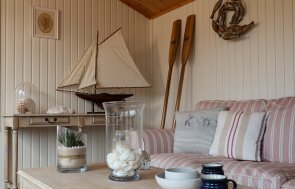 Our selection of stylish Summerhouses offer the perfect idyllic garden hideaway, whether you want to relax, dine, play, work or relax inside. With a wide range of Summerhouses available, you are able to tailor it to your specific needs – whether you want to create a relaxing haven to enjoy the best of your garden or a space to host year-round dinner parties. If you like the look of this Summerhouse, you can view our full range by clicking the link below.